Our easy to use product puts the fun back into keep dental upkeep, your kids will love being the boss in the bathroom. Put your kids in charge. Resembling nunchucks, our GumChucks bring enjoyment back into the morning and evening routines. Our innovative design means kids can floss without parental supervision – Once an established part of the teeth cleaning routine you’ll quickly become one of the dentist’s favourite patients. 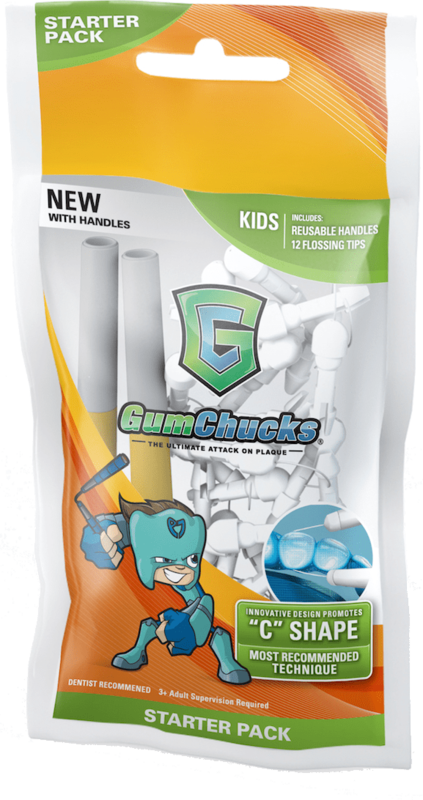 Keep kids entertained while flossing with GumChucks. The nunchuck design will keep children excited to floss day after day – Making flossing part of their routine from an early age is incredibly important in the future of their dental hygiene. Create enjoyment around flossing and make your kids boss of the floss. Empower your children to take charge of their dental care routine and watch as their teeth grow healthily, while they grow with a smile!